How to access free mobile Google Search powered by Globe? Globe claims to be the world's first telecom operator to offer free access to the World Wide Web or internet and select Google services on internet-enabled mobile phones without charges. 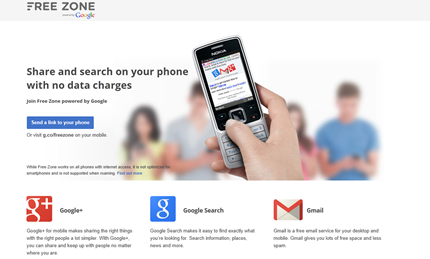 Recently, Google launched the Free Zone which lets people access websites on their featurephones for free as long as they get to the site via Google Search. The Philippines is considered the first country in the world which Google intends to launch the service. The giant search engine company partners with Globe Telecom, local carrier to deliver the aim of 'the next billion online'. The service allows phones with an internet connection but limited functionality to access basic Google products like search, email and its social networking service Google+ for free. According to Reuters, target of the project are those who have 'featurephones' rather than smartphones. From Wikipedia, featurephones are mobile phones which at the time of manufacture is not considered to be a smartphone due to it lacking in several features, but nevertheless has additional functions over and above standard mobile services. It said that the growth in smartphones in the Philippines reached three-fold for the last 12 months up to September 2012. However, smartphone current share in the country is only 24 percent according to research. Reuters report that Globe and Google are not the only carrier in the Philippines to offer cheaper way to access internet and target feature-phones. Smart Communications, the major telco player in the Philippines said that half million users who signed up on their pared down internet service last year spent 150 percent more on average per month than its other subscribers. How to Use Freezone Powered by Google? 1. Make sure you have internet-capable phone to surf. 2. You must have Google account to log-in. Don't worry, if you currently have no account you may sign-up here. 3. You should be using Globe Prepaid or TM sim. 4. Access the main landing page of Free Zone here or text LIBRE to 8888 for Google mobile services for FREE. Note: Promo is open to all Globe Prepaid and TM subscribers until Mar. 31, 2013 only. For smartphone users, you may need to configure your phone and/or phone applications to stop automatic syncing to ensure no data charges are encountered. Make sure you have the correct internet settings on your phone. Simply text Go to 2951 for free.